May 22, 2010. Al See sent in the following email and pictures. While working to refit my minister's Kittywake, I did some web research on it and was astounded at the amount of information about his boat that was available. 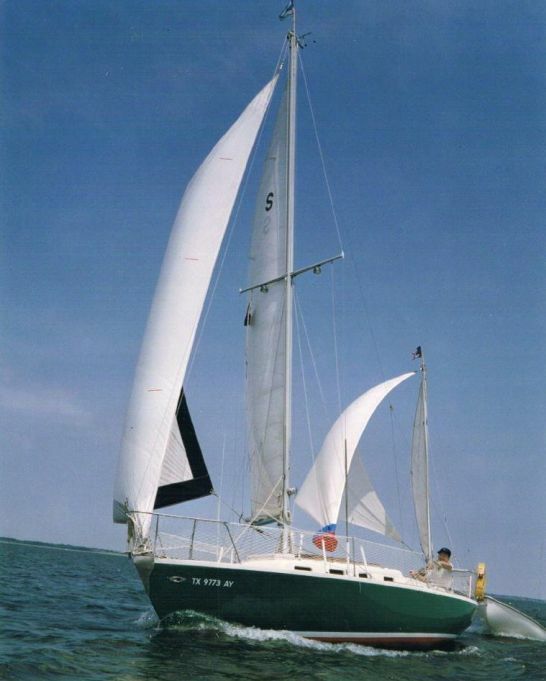 Since I last looked for info about my Shaw 24 yawl "Elation" in the late 90's, I looked again and found your wonderful site. Thank you for creating a harbor for Shaw 24's. Here's a brief recap of "Elation" and if you want more I'd be pleased to provide it. Above is a picture under full sail from 1985. Her layout is quite different from "Trina's" in that she has a V-berth forward, a full bulkhead with door, hanging locker to starboard and necessary to port, full bulkhead with door, and main salon with lockers and quarter berths. This design down below explains why she has 4 portholes per side in the cabin trunk. A galley with sink is between the quarter berths and serves as a step up and out the companionway to the bridge deck. The cockpit seats take advantage of fiberglass's strength in curves and, instead of being flat, conform nicely to the human posterior. Beneath the cockpit sole lives a 10 hp Atomic 2 complete with cast iron oil pan. 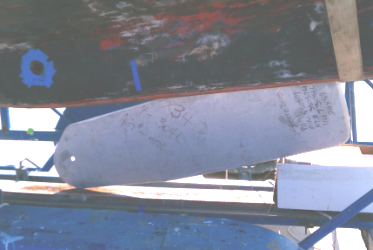 There is a cutout in both the keel and 1/4" iron plate rudder to allow a 9.5" bronze propeller. She joined our family in Dallas, Texas, in December of 1982 eight months after my wife, Betsy, and I were married. She came from the Houston Yacht Club. 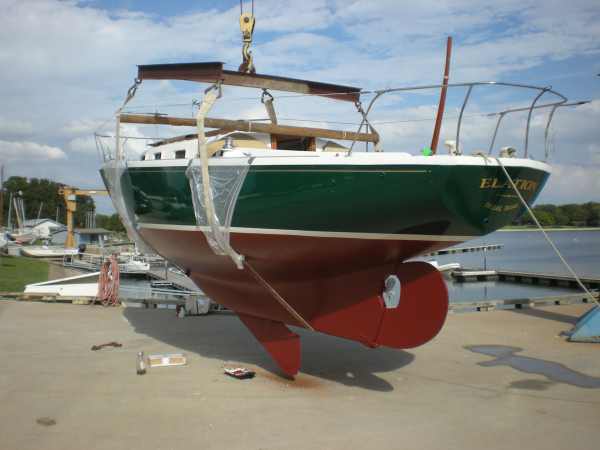 The following fall a hurricane blew across HYC sinking the yacht then in Elation's former slip. The yacht in the slip immediately to starboard was cast into Elations former slip and also sunk. The next yacht to starboard was cast into Elation's former slip and did not sink due to the crowd on the harbor bottom beneath. Had Elation been at HYC she would have been lost beyond salvage. After 5 years of cruising Lake Ray Hubbard, we thought we were bold to take our 1st born out for the night at the tender age of 2 months old. 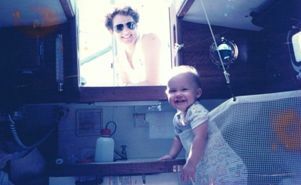 Our second child had the advantage of our experience and came aboard at the age of 2 weeks. For years Elation was known as the "floating crib" due to the netting from toe rail to lifeline. It took our children years before they realized that everyone didn't grow up on a boat. Now our oldest child has graduated college and, happily, has a job and an apartment in Dallas. Better yet, she has been asking "when can we go out for a night on Elation?" I appreciate your including Shaws on your web site. I was interested to read Chip Morris was indeed involved in her building and to learn of the 2 other builders. 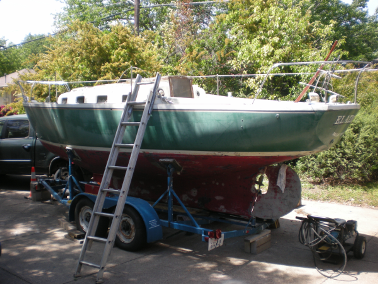 I heard that the Texas boats were made from a mold taken from "Thumbelina" when she was first at the New Orleans Yacht Club. Sadly the local Houston "Shaw Historian" was lost at sea off the Baja before I learned much more. In the mid 1980's there were two other fiberglass Shaws in the Dallas area. One was at the Fort Worth Yacht Club where I became friends with her owner before she was sold. The other was on the hard in Plano and was interesting because the owner had both added a bowsprit and lowered the centerboard and glass over it to extend the keel. August 21, 2010. Al sent in an interesting bit of information about Norris Hoyt (Addicted to Sail) and his O'Day Dolphin Telltale. Click here to go there. August 21, 2013. Its been 3 years to the day since Al checked in last, but he has been busy. Here is his update and photos. A quick note to begin catching up after a busy few years. I brought Elation home for a re-fit in 2010. Ended up painting the deck, freeboard, boot and bottom. I have many pictures of that if you would like them including a sequence all shot from the same corner of the driveway porch. I am still very grateful to Karl Boonzaaijer for all his help. 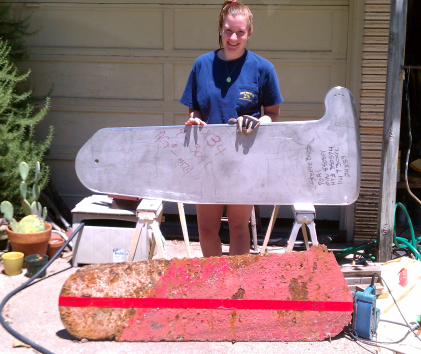 In 2012, the centerboard jammed. Found out it was from a thru hull fitting that must have dropped into the centerboard trunk during construction in 1962, got stuck high up and worked its way down over the years. 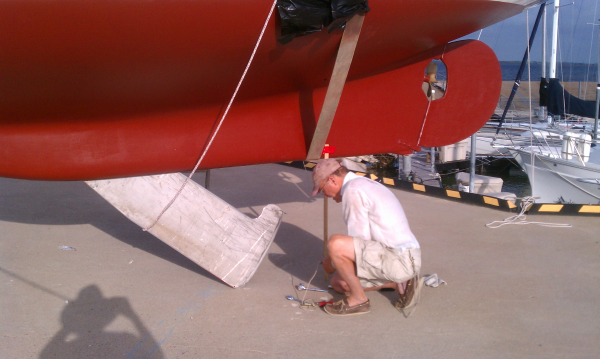 Then in 2013 I took Elation out of the water to figure out the centerboard issue and ended up replacing it. I was concerned that, being mild steel plate, it had become so thin it might bend under sailing pressure. The new board is stainless, cut with a waterjet and faired with a hand grinder (2 days work!). More importantly, I talked to the daughter of the original owner who told me that, when she was a girl, the Atomic 2 was trouble to run. So I decided to stop trying to made dependable an engine that did not run well when new and re-power. Good heavens what a mess it left! 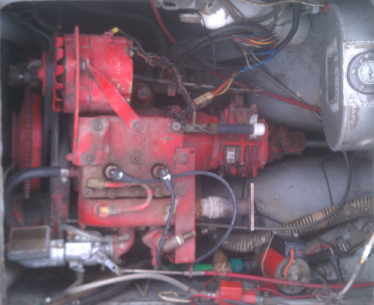 Settled on an Electric Yacht 5KW motor and am so enthusiastic about it I became a dealer for them. Glad to help any Dolphin owners considering going green/electric. Many thanks for your wonderful website. Its fantastic, also, to see the collection of Shaws you have found! November 4, 2014. Al See sent in Shaw 24 blueprints by Bill Shaw. It appears they are copies of the original blueprints for TRINA, Shaw 24 #1 which was commissioned by Wilbur Scranton. Fifty seven years ago this week Bill Shaw was working in the drawings. Click here to go to the prints and also to see full size PDFs in large scale - and a fascinating look back in time. I think you are going to love this! I finally found 2 old Shaw 24 blueprints I copied in the early 80's and had them digitized. What I never noticed on the paper copies is the date in the block: 1 Nov and 10 Nov 1956. 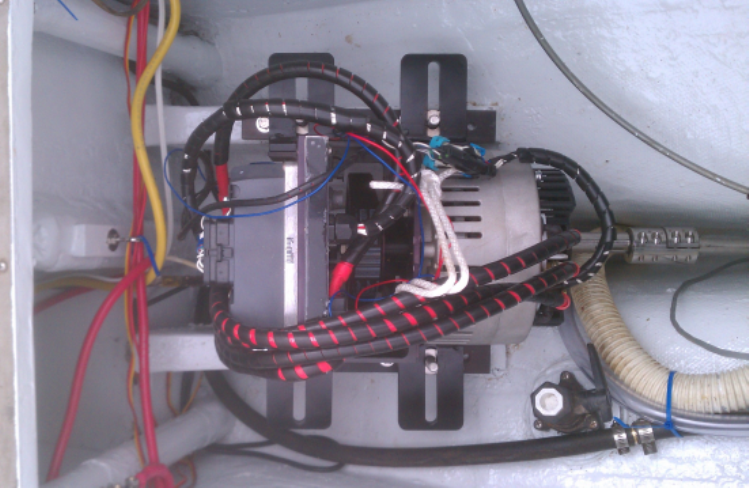 I have also completed a first draft on my Electric Yacht of Texas web site with my whole re-power story. http://www.electricyachtoftexas.com/. On the home page are two fun YouTube videos of leaving the slip and going sailing under Atomic 2 and electric. The noise difference is remarkable! Not to mention the electric is completely dependable. 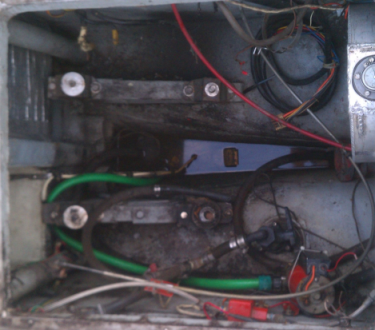 On the "My Repower" tab is a complete step by step pictorial of the conversion with comments. Please feel free to use any of this you like or let me know & I'll send you full size pictures. Al has offered to provide technical advise to any Dolphin owner considering electric power. He can be reached through his website above, or his contact information, along with other electric power information is on the Electric Power page in our Technical Section. Click here to go there.